We are family-owned and operated since 2002. We consider it our foremost responsibility to keep our clients' pets safe, healthy, and happy during their time with us. We are honored that our clients entrust their pets to us, and we are committed to providing them with the best possible care. Our goal is to continue to improve and expand our services and facility while maintaining our high quality of care for our clients' pets. Our staff is trained using Robin Bennett’s “Knowing Dogs” staff training program. This is an interactive program including videos, tests, and mentoring to ensure all staff members are properly trained on safe dog interactions and group play. Unlike traditional kennels where dogs are just cooped up in a room all day with little interaction, at Dogs On The Farm & Cats Too we do Play & Stay boarding so every guest gets to participate in a 4 hour group play session or an individual play session each day during their stay. Group play provides socialization, healthy play, fun, and exercise. Unlike other daycare facilities that offer daycare in a concrete warehouse or tiny room, we feature the largest play areas around. 20,000 sq. ft. outdoor play yard with custom built pools, waterfalls, a "Puppy Playground", and professional agility equipment. 7,000 sq. 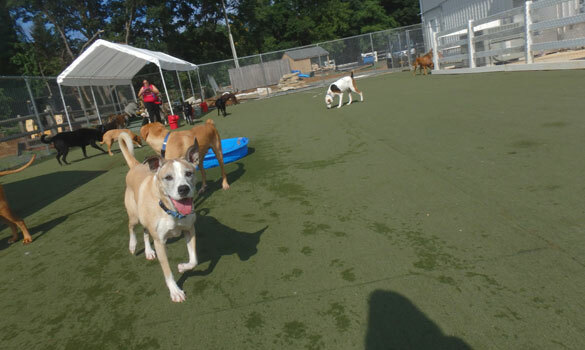 ft. heated indoor arena with a "Puppy Playground", state-of-the-art dog-friendly turf, and professional agility equipment. Allows for playtime on bad weather days! We also offer 2 large pools to dip in while watching the large horses. While at the Farm, you may choose from a variety of a la carte activities, activity packages, accommodation options, and add-on services. From doggie ice cream and a daily photo update for mom to a farm walk or a visit to the grooming salon - we can satisfy every pet and every budget! View our activities and extras. We offer unrestricted live "doggie cam" access so you can keep an eye on your furry loved one from your computer or mobile device. Check it out. At Dogs On The Farm & Cats Too, what you see is what you get. Stop by for a tour - we'd love to show you around!